While heading home from a trip to Fredericksburg, Texas, my husband and I stopped in Dublin and quenched our thirst at the oldest Dr Pepper bottling plant in the United States. Entering through Old Doc's Soda Shop, which serves fountain drinks, sandwiches and ice cream, I felt like we'd stepped back in time. And our guide, Gwen, only enhanced that impression when she stopped at an old-fashioned soft-drink cooler–the kind that dispensed glass bottles for a nickel–and handed us each a bottle of Dr Pepper to sip during the tour. Then we proceeded past vintage machinery that washes the bottles, fills them with syrup and carbonated water, caps them and then turns them over three times to mix the concoction thoroughly. Then they're hand inspected and packed, also by hand, in cases. Kloster collected all things Dr Pepper, and we saw much of it on display. We were amused to learn the company had promoted drinking the soda “at 10, 2 and 4” to prevent an energy slump! As we drank down that last sweet drop of original Dr Pepper, we agreed that it's great that some things never change. Dublin is where U.S. Highway 67/377 meets State Highway 6 in central Texas, about 75 miles southwest of Fort Worth. For information, call the Dublin Chamber of Commerce at 1-800-938-2546. 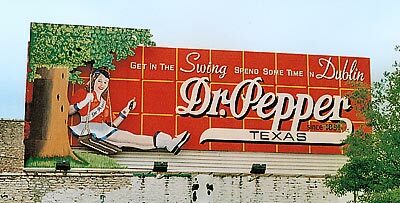 Tours of the Dr Pepper Bottling Company (105 E. Elm St.) run daily. The bottling line operates only on Wednesdays as needed.. To learn more, call 1-888/398-1024.